DopplerPad Loops are well-suited to be made into ringtones because, well they're loops! That way they can play over and over seamlessly while you dig your iPhone out of your pocket, impressing everyone in earshot. Note: most of this info will of course work for any audio file including stuff from Recorder, FourTrack, and Vox 300). Open Wifi Sync from the Tools menu, Follow the instructions to transfer the loop(s) you're using to your computer. Open GarageBand, and drag your loop file onto it. GarageBand will make a new track. 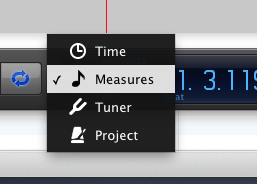 Set the LCD mode to "Measures" — this makes it easier to work with the timeline in this case. Due to a bug in GarageBand's ringtone creation*, I like to copy/paste my loop about 4 times in the track. This ensures a seamless playback of your loop. Turn on "Cycle" (loop), and set the cycle Region to the length of your ringtone. Save the project. and play back your ringtone to make sure everything sounds right. Found under the Share menu in Garageband. 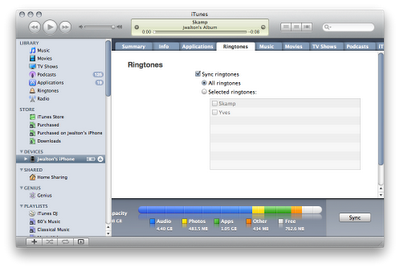 This will export the ringtone, and place it in the "ringtones" category in iTunes. 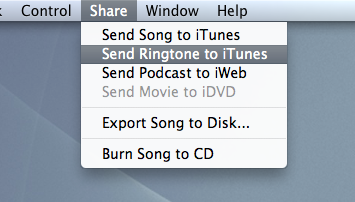 First, check the sync settings for ringtones, and make sure your new ringtone is there, then sync! On your iPhone, open the settings app, and you should see your new ringtone under Sounds > Ringtone! * About the Bug Ideally, you would simply set the Cycle region in GarageBand to the loop length of your DopplerPad loop. This should be perfect, since we know the exact tempo and length of the loop from DopplerPad. However, I've noticed that for some reason, GarageBand always adds a bit of arbitrary silence to the end of a cycle region when creating a loop. Some people may not even notice this, but to my ears it stands out. 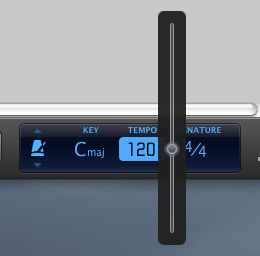 This is the reason I copy/paste the loop a few times in Garageband, which effectively makes the playback seamless. Someday, it would be cool to be able to create ringtones right in the app (Apple's API's don't allow for this yet), but until that time, this process is actually pretty simple! If you wanted to make a ringtone out of something non-looping like a Recorder memo, FourTrack song, or VOX3000 snippet, you can pretty much use these instructions, and ignore stuff about making it loop properly.